I'm E, Frantic Mama's 2 year-old daughter. That's me, in the picture there. 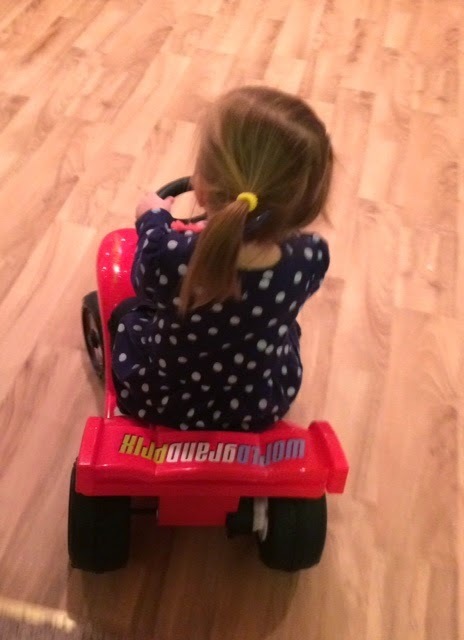 I was riding my brother's McQueen car around the basement this morning while it was still dark outside. FAST! Really, really fast. In circles. I'm taking over my mommy's blog today because she says she's tired. Can you even imagine? Tired? At 1 in the afternoon? She tried to get me to stay in my crib for a nap because she doesn't seem to understand that people aren't supposed to sleep during the day. She's so silly. My mommy thought she would take a shower while I was awake and free from my crib. I had fun! First, I put all of the towels on the floor in a big pile and jumped in them. I heard my mommy mumbling something from inside the shower like, "E! Stop doing that! E! I just folded all of those." It's game we play, and it always makes me laugh the hardest. Then I got bored and decided to unroll the toilet paper and run it up and down the hallway. I knew my mommy couldn't stop me because she was naked in the shower. My brother thought this was really funny, so I kept doing it. Later, after I watched her clean up all the toilet paper, my mommy said something along the lines of, "Okay kids, we should go outside to play for a bit in the snow since it's not below zero anymore." She didn't sound that excited, but I was! So was my big brother. It took us a long time to put all of our snow stuff on. I like to take breaks while she gets me dressed, and do fun stuff, like go up and down the stairs, take all the pots and pans out of the cabinets, and fish through the pantry for the candy she hides way in the back. She chases after me, mostly, which is fun for her. After my mommy had gotten me all bundled up in my snow pants, I needed to go poo poo. We had to start getting dressed all over after she forced me to lie on the floor while she changed my diaper. Ugh. That's the worst. My mom looked hot and sweaty and said something like, "Sheesh, is this even worth it?" and gulped down that brown stuff from her mug that she's always carrying around the house. We played outside for a little and then I was ready to come in again. No one was listening to me, so I started yelling, "A show! A show!" until they couldn't take it anymore and we came inside. The second the show ended, I decided I was ready for lunch. I announced "I'm hungry!" and ran over to the kitchen table, wondering where my food was. This made my brother hungry too. 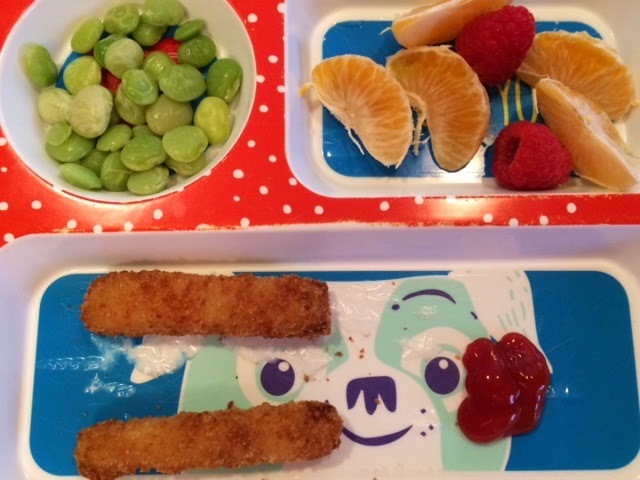 I ate one raspberry and a few bites of those long brown things she calls fish sticks (that don't look anything like fish) dipped in the red stuff, and then decided I wanted to go play with legos. I just didn't feel hungry anymore. I better go. My mommy probably wants to play hide-and-seek with me again or send Hot Wheels back and forth with my brother and me for a couple of hours. Maybe she'll take us to that big store later where my brother and I sit in a cart and get a cookie and buy food and toys while she says funny things like, "Sit down. Don't touch that. No, we can't get those." P.S. My mommy recently changed her blog address from www.FranticMama.blogspot.com to www.FranticMama.com! You must be the lady my mom is always going on and on about, her "blogging friend, Dakota," and her "artist friend, Dakota." I'm not one to meet people online, but who am I to judge? Glad to finally meet you! I think Munchkin, Elf and I would get along great. I hear they like to jump on old mattresses too. I'm really good at that. This is amazing, E! I love your work with the toilet paper....and perfect timing with the poop. Hope you routinely woke up in the middle of the night for water breaks, too. If not, there's always tomorrow! It's like I always think with the poop-- when you've gotta go, just go! Church, McDonald's, music class, wherever! Thanks for the support about the toilet paper; I had time to unravel the entire new roll that time! My mom just balled it up and used it anyway. She's always talking about "not wasting stuff." So I guess I helped her again. I like this nighttime water break idea. My mommy always just leaves me in my crib all night, even if I'm singing Frosty the Snowman as loud as I can, or talking about the latest Umizoomi episode. It's like she doesn't even care (one of her favorite lines is "I need my sleep! Just go to sleep!"). I'm off to check out your blog now too. When I see my mom eyeing me like this, I know she's thinking about putting me in my crib for another nap, so I act as busy as I can so she forgets about it. What a day! This made me laugh, though. Taking it from their perspective always helps make me less upset, too, when I have to clean up after... :). Well done. Glad you could laugh a little at my hijinks :). My mommy finds that laughter-- as she says-- "gets her through the day" too :).